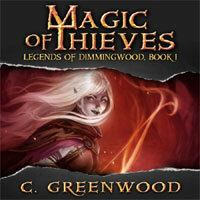 Magic of Thieves is available as a FREE READ! Download your copy (PDF) today. Or click on any of the order links above to get a copy for your ereader. The brisk autumn wind plays through my hair and tugs at my clothes impatiently, as if trying to pull me down the forest trail more quickly. Each new gust sends a storm of red and ocher leaves showering to the earth to crunch beneath my boots as I follow a well-remembered path to a better remembered destination, one that has been my home for a long time. One that will be my home no more after today. Unwilling to explore the feelings accompanying that realization, I jerk my thoughts quickly in a safer direction. It’s surprisingly easy to feel hopeful right now, despite the previous day’s events. The birds are noisy in the trees overhead and the sun is rising in the sky to warm my back. Or possibly that reassuring warmth is radiating from something less dependable than the sun – the bow slung across my back. The bow often grows warm, glowing with an eerie light for no apparent reason. I’m still not used to that. I’m not used to a great many things, not the least of which is the plan before me and all that led me to it. Mama’s voice was tense and her hands were busy as she spoke, shoving food and provisions into a bag. “Never mind. There’s no more time,” she said, snatching a woolen scarf from a peg on the wall and kneeling to wind it around my head and shoulders. I couldn’t understand the reason behind the tight lines around her mouth or the dread filling her eyes. painfully into my flesh and I gave a little squeal of protest, but she appeared not to hear it. I was amazed at being permitted to go outdoors with bare feet in the dead of winter, something that had never happened according to my short memory. I still wore my sleeping gown beneath my cloak, and my silver-white hair remained matted and uncombed. Mama threw open the door and an icy blast of wind slapped me in the face, cutting through my clothing. I peered out through the torrential sleet and into the dim world ahead. It was not yet light out, but I could just see far enough ahead to make out Da pulling the cart into the yard, our old nag hitched to the front. Grabbing my wrist, Mama dragged me out the door and down the front step, moving with surprising strength for a woman so small. My naked feet barely touched the frozen ground but when they did the cold of the sleet-spattered mud made me cringe, so I ran as fast as my short legs could carry me across the yard. A shrill scream erupted suddenly in the distance. Carried on the wind, it echoed across the valley, rising over the gale of the storm. Fear shot up my spine as Mama froze for a moment, looking off toward the hills ringing our farm. A little village lay just over the near rise, but it was impossible to see beneath the darkness and the thick veil of the blizzard. Spurred by the scream and the series of chilling cries that followed, Mama took to her heels again. I stumbled over the frozen earth and she grabbed me up in her slender arms, carrying me the rest of the way to the cart. I could feel her heart thudding against my ear as she ran, her breath rasping in and out as she stumbled to a halt alongside the wagon. Then I was passed into Da’s strong arms and lifted upward. “They’re coming!” Mama had to shout at him to be heard over the wind. “I heard.” Da sounded unrushed. His eyes met hers over the top of my head and she seemed to grow calmer beneath his steady gaze. Da didn’t answer immediately, settling me down quickly in the bed of the cart and giving me a reassuring pat on the head. “I won’t go without you,” she insisted. time, but a ferocious howl of bloodlust. The shout was swiftly echoed by a host of others, each sounding closer than the last. and into view. Then, what looked like an entire army was pouring down the hillside like a flood, aimed directly at us. The scene wasn’t lost on Mama and Da. He nodded wordlessly and bent his head to hers in a swift kiss. Then, without another word, he was gone, a tall shadow disappearing into the falling sleet. I had no time to comprehend what was happening. Mama scrambled into the cart ahead of me and took up the reins. I looked back over my shoulder and saw the descending horde of horsemen riding into our farmyard. One instant they filled my vision, a black tide surging toward us, the next, a lone shape stepped into their path. My Da made a strange figure, standing alone before the fierce inflowing host, a wheat scythe gripped in his hand. Our cart lurched forward, and I was slung roughly against the back as we bumped along, picking up speed. I glanced behind us in time to see the dark figure that was my Da disappearing beneath the thundering hooves of the first horsemen. sucking in the air in great gulps, choking on the freezing rain that found its way down my nose and into my mouth. beside me, lifting me gently off my back and tucking my head under her dry cloak. I clung to her waist, shivering against her warmth, and breathed in the heavy scent of soggy wool. Then I became aware of the rumbling of hooves, signaling the approach of many horses. Safety disappeared as the world came rushing in on me again. Mama quickly pushed me back from her and set me on my feet. I tried to crawl into her lap again, but she held me firmly at arm’s length. I squinted through the downpour and made out the shapes of the horsemen bearing down on us, their scarlet cloaks flaring out behind them, the beating of their horses’ hooves drowning out the thunder of the skies. Mama’s hands were clumsy, her face slick with rain so I couldn’t tell if she was weeping or if I imagined it. Taking my head in her hands, she put her forehead against mine until I could see nothing but her face. Her eyes were wide, her mouth tight. Strands of wet hair, whiter than pure snow, clung to her face and neck. 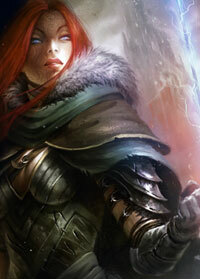 Fumbling inside her cloak, she withdrew something that she pressed hastily into my hand. It was too dark to make out what it was, but the object was cold and hard like metal with ridged edges that cut into my palm when she closed my fingers tight around it. Before I could answer, she pushed me roughly away from her and I reeled forward. I hesitated, every instinct telling me to disobey the incomprehensible order and cling to my one source of safety. But she was already turning her back on me to face the approaching horses with arms outspread, as if she could hold back the tide of darkness. Blue sparks of magic appeared, sizzling at her fingertips. and several riders were thrown to the ground, but others barreled on. sweep toward her in a single, smooth motion and she crumpled to the mud like a broken doll. I felt nothing. No anguish, no horror. Senses overwhelmed, I ran like a wild creature to outpace my pursuers, until I made the shelter of the thick trees at the edge of the farmyard. Plunging into their depths, I was whipped by sharp branches and tripped by saplings and fallen logs looming out of nowhere. The darkness was so complete I couldn’t tell where I was going. One moment I was stumbling blindly through the undergrowth, the next, my feet tangled in a thick tree root and I fell headlong into an overgrown pile of brush. Thorny leaves pricked my hands and face, immediately setting my skin tingling with the mild toxin they secreted. I struggled to fight my way free of the mass, succeeding only in gathering more injuries and tangling my hair among the branches. of my breathing sounded louder than the noise of the approaching horsemen, and I wondered if my enemies could hear it, for they moved closer with every second. Heavy blundering noises and men’s muttered curses told me the darkness and density of the forest impeded their progress. Hearing the sounds of shifting armor and that of many feet thudding to the ground, I trembled and burrowed deeper into my thorny hiding place, ignoring the pain as the needly leaves pierced my skin. My lanced hands and face were growing strangely numb. The startling crack of a stick underfoot alerted me that at least one of my pursuers stood mere paces from me. I strained to see him but could make out nothing, not so much as a moving shadow in the darkness. I squeezed my fingers tight around the round metal trinket Mama had thrust into my hand and pressed myself flatter to the ground, the movement rustling the leaves around me. His chuckle was followed by an unfamiliar whisper, like the sound of drawn steel. As he stamped at the surrounding shrubbery, I wrapped my arms around my head and willed myself to sink into the earth or to turn into a pebble or an insect, anything beneath notice. To my dismay, I remained a solid human being. His foot sank into the thorny brush beside me, his shiny black boot resting next to my hand. A finger’s breadth farther and he would be crushing my fingers. He had but to look down to see me huddled at his feet. potent mixture I was creating. Even as I concentrated on the magic I was forming, a vague, unsought awareness of my enemy’s cold weariness filtered through my senses. Startled by this unfamiliar consciousness of another being, I almost dropped my hold on the magic. Quickly, I released the weapon I had formed, casting it from me and into the path of my enemy. My magic slammed into him and, with a muffled shriek, he stumbled backward, dropping his sword. I heard him collapse to the ground, then there was no sound but the rattling, wheezing noises of his struggle for breath as the magic fastened itself to his throat. I lay still and waited until the sounds of his choking ceased. I could still hear the others out there, crashing through the wet underbrush, but I felt too drained to move. My body was numb, disconnected from my mind, as I lay listening to my heartbeat and feeling drops of sweat form, despite the cold, and trickle down my ribs. There followed some noisy conferring about whether to continue pursuing “the child” or to concentrate their search on the other possible escapees. I heard my nonexistent companions declared a higher priority than I, and soon the footsteps of my enemies receded into the distance. Too exhausted to feel relief or to think of using this opportunity to run, I closed my eyes and groped after that strength-giving fire within, but it had deserted me. farmhouse for weeks, so I survived the cruel times that destroyed most of the magickers in the province. I leaned all this when it was later recounted by Master Borlan, but I couldn’t have been above six years old and my memory holds little record of that dangerous time. I don’t recall the fear I must have felt cowering in the dark of the cellar or the fading fever and partial paralysis as the toxin worked its way out of my body. I have no memory of the fearful, whispered conversations that must have taken place over my head, nor could I have had any comprehension of the grave risk Da’s friend took upon himself and his family in protecting me from the soldiers determined to wipe out my people. But of this I must have been aware. My future was uncertain and I was very much alone.